Last year 93% of malicious breaches came from phishing or social engineering attacks. When many people read this statistic, they assume humans are the weakest link. People are not the problem; they are the solution. Educated, empowered people are your best defence. Beauceron is a cloud-based behaviour change platform that quickly integrates with any environment. It gives people a better way to measure their cyber risk and awareness and tangible ways for them to improve. It does what FitBit and Apple Watch have done for exercise – sending the right signals at the right time to help people make better decisions. The platform does all this while also making it easier than ever before for IT and security teams to plan, deploy and measure the success of cybersecurity training. Empower your users to actively engage with the security team. Automatically provide contextual and relevant training to users. Automatically send out phishing campaigns and empower users to report. Engage leadership in security providing a clear overview of risk posture. 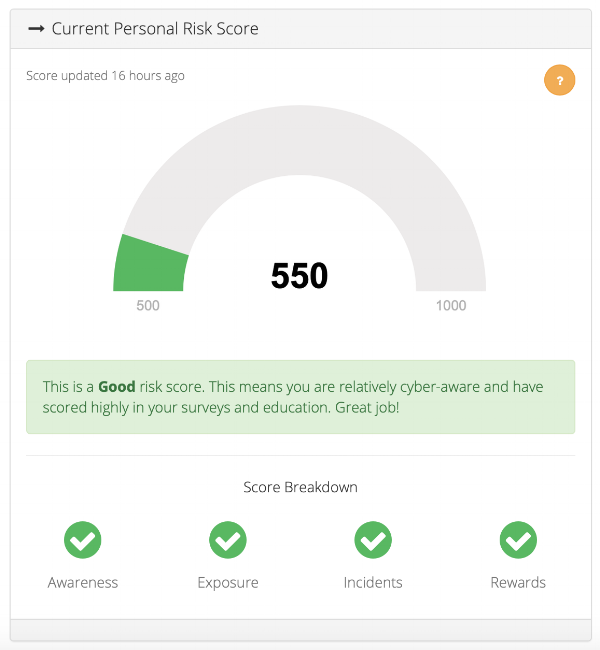 The personal risk score is an individual’s cyber risk compass. It tells them if they’re headed in the right or the wrong direction and gives an opportunity to improve by correcting risky behaviours or filling in knowledge gaps. The risk score applies some of the key concepts of gamification by incentivizing good security behaviours through our revolutionary approach to status and recognition-based rewards which clearly contribute to improved scores. Beauceron fixes a key problem with traditional cybersecurity awareness - the inability of people to see the connection between their knowledge and behaviour and the risk they pose to themselves and their organization. Whether you want to have the automated random simulations run on a configured basis, manually schedule specific campaigns, or run campaigns without supplemental training – Beauceron easily adapts to your goals. With our in-tool editor, you can easily customize or create your own phishing simulations within the Beauceron platform. Beauceron’s PhishForward reporting tool makes it easy for employees to forward phishes to the correct location. Beauceron automatically and immediately follows up with users to let them know if the e-mail was a simulated attack or a real one. By seamlessly integrating our powerful approach to phishing with the calculation of the Personal Risk Score, Beauceron enables you to automatically reward employees for being an active part of the defence. Choose from our course gallery when scheduling learning throughout the year and assign relevant training based on the division level or to a specific individual. For SME’s our out of the box workflow covers the basic security awareness training, for advanced teams the workflow and content can be customized and contextualized to fit your needs. Designed and written by security experts, Beauceron's out-of-the-box content provides an excellent overview of the threat landscape and how employees can protect their organization. Is there a specific challenge your organization is facing? Build a custom course in our editor and deploy it to specific people, entire divisions or the whole company. If you already have invested in custom SCORM 1.2 courses for your organization, you're able to upload it to use in lieu of our course content or in combination with it. Beauceron has easy-to-understand yet powerful questionnaires, surveys and self-assessments for your team members, including those for your IT teams, security leadership and executive management. Beauceron maps your team members’ self-assessments back to each of the sub-categories in NIST to calculate a Readiness Score. Beauceron calculates a holistic Cyber Risk Score at the divisional and the organizational level. Security roles enable leadership teams to have access to the organizational dashboard and reporting features of the division for which they’re responsible. Beauceron’s common framework enables organizations to benchmark themselves against the Beauceron Index, the average Cyber Risk Score of all customers. Beauceron’s Risk Advisor highlights areas of opportunity for you to begin reducing your cyber risk, categorizes them by risk factor and prioritizes them based on the knowledge of our security experts. It provides IT teams an easy way to prioritize upcoming projects, while showing management teams the steps being taken to reduce risk. Keep your information safe in our secure cloud infrastructure with multiple layers of physical and digital security including data encryption at rest and in transit. Easily configure Beauceron’s data retention policy within the platform itself. Integration with Office365, ADFS and SAML-based identity providers for single-sign on and automated user provisioning make it fast and easy for users to be onboarded with their existing organizational information. Insightful reports with metrics and key risk indicators that make it easy for managers, senior executives and boards to gauge cyber risk and organizational efforts to manage that risk. Built with global organizations in mind, Beauceron has a multi-lingual framework. Easy to understand, yet powerful questionnaires, surveys and self-assessments for your team members, IT teams, security leadership and executive management that help identify key risks in user behaviour, perception and awareness as well as organizational culture. Keep your information safe in our secure cloud infrastructure with multiple layers of physical and digital security including data encryption at rest and in transit. Easily configure the data retention policy for Beauceron within the platform. Cybersecurity awareness courses delivered automatically within Beauceron with our proprietary courses, build your own custom courses with our editor or import SCORM 1.2 courses. Easily customize the Beauceron Platform to your organization's brand and culture. Easy to deploy and complete scalability leveraging our cloud architecture, with low administrative burdens on your IT or cybersecurity team. Integration with threat intelligence sources to check if your organizational members' information is showing up in known major data breaches, which are often used to generate new attack targets. Real incident capture tool that documents material cybersecurity incidents. This helps leaders understand threat and risk trends and helps automate education and accountability for any organizational members involved in the incident. Automated phishing simulations designed to test user knowledge after they've been trained on how to spot and avoid social engineering attacks.